One of the biggest criticisms of Remote Desktop Services on Windows Server 2012 has been its general lack of manageability. The first thing RDS admins notice is the disappearance of TSAdmin. Now, in order to manage RDS on Windows Server 2012, you must use the RDSM (Remote Desktop Services Manager) component embedded inside Server Manager. However, the RDSM component will not work in workgroup deployments of RDS, and it also requires specific roles (e.g. the Connection Broker) to be deployed in order to work properly. Even then, the UI can be clunky to work with and in larger collections, does not scale well. For RDS admins coming from a Windows Server 2008 RDS deployment who used to use TSAdmin and TSConfig, the differences around management techniques could not be any starker, and in general frustrates them to no end. Look no further than the Remote Desktop Services Forums on Microsoft’s TechNet site if you don’t believe me. Full disclosure: I am the CEO of RDPSoft. You can perform intelligent shadowing operations – e.g. our tool will look at the remote OS level of a session host and will automatically use MSTSC or an in-built Terminal Services Client to start the shadowing process. You can do a lot of additional tasks not available in RDSM, such as looking up bandwidth statistics by session, reviewing session latency and error rates on RDP 8 connections, viewing the OS level of the client, etc. 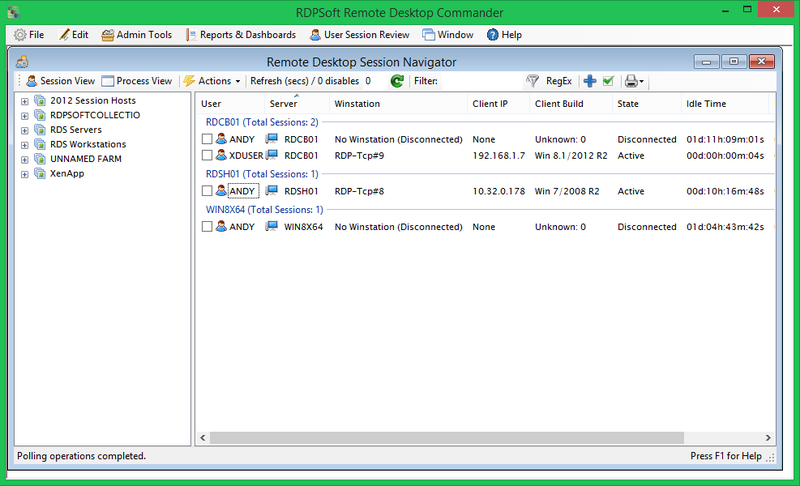 For complete information, including feature lists, screenshots, a demonstration video, and a download link, please visit the Remote Desktop Commander Lite product page at RDPSoft. I sincerely hope it makes your life a lot easier. You should receive a knighthood from the Queen for services to sysadmins everywhere.